Google Ads can get overwhelming with so many metrics and options. Don’t worry though, it’s easier than ever to create awesome reports with our preset Google Ads template, preset widgets, and easy-to-use features! 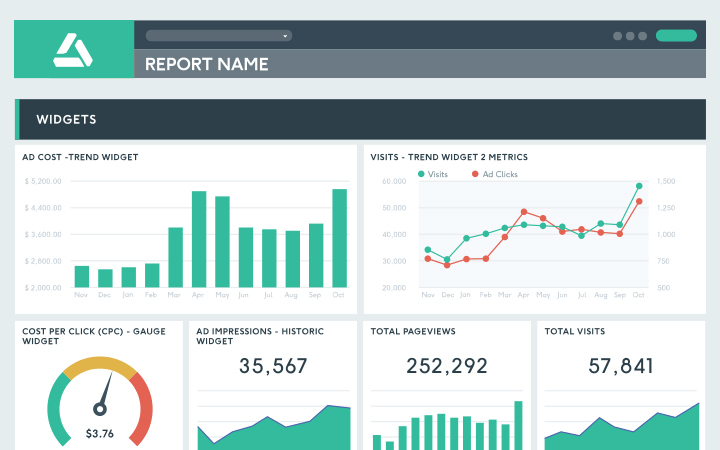 With our Google Ads reporting tool’s wide range of widgets and features, pretty much everything about your report is customizable. You can add images, comments and insights, or add a white label design so that your reports fit each of your clients’ branding. All of your data can be added with just a few clicks. There’s no programming or third party systems involved. The best part? It’s all automated, so no monthly copy-pasting either. Simply add your integrations and let us do all the data fetching for you! All the data YOU need! Google Ads is just one marketing tool you use. But any great Google Ads reporting software should be able to gather data not only from Google Ads but also from ALL your marketing tools: Facebook, Google Analytics, Twitter, LinkedIn, SEMrush… DashThis offers 30+ integrations. You can even integrate them all into the same report, and use our CSV file manager to add any other data you want to include. Why do so many marketers and agencies trust our Google Ads reporting tool to present their data? Because it creates reports that are equally beautiful and easy to understand. Today, we’re proud to provide thousands of marketers and agencies all around the world with the perfect Google Ads reporting tool. Want to know what they all have to say about us? Take a look! What makes a good Google Ads reporting tool is the variety and relevance of the features offered. With its intuitive design, simple customization, numerous sharing options, multi-user access, DashThis has got everything you need! With our Google Ads reporting tool, you don’t pay extra for each feature you need: all our features are already included in every single plan. Regardless of the plan you choose, it’s all here: all data sources, unlimited number of users in your account, your very own dedicated account manager, all the preset widgets and templates... everything! From campaign costs to number of clicks, impressions to ROAS, your Google Ads PPC campaigns involve a lot of metrics, and it's easily to get lost in your KPIs. With our PPC report template, all you have to do is plug in your marketing tools, and you're all set to start reporting! Read our blog for more Google Ads reporting related content! Want to learn all about the features of our Google Ads reporting tool ? Interested in the fantastic world of reporting? Our blog is THE place for you to be! In order to never miss out on an interesting topic, you can also sign up for our newsletter (we promise it’s worth it! ).